↑ Doris Kurella: Kulturen und Bauwerke des Alten Peru. Kröner, Stuttgart 2008, আইএসবিএন ৯৭৮-৩-৫২০-৫০৫০১-৯. ↑ John Alden Mason: Das alte Peru. Eine indianische Hochkultur. Kindler, Zürich 1965. ↑ Schjellerup, Inge R. Incas and Spaniards in the Conquest of the Chachapoyas. Göteborg University, 1997. ↑ ক খ Lieselotte und Theodor Engl: Die Eroberung Perus in Augenzeugenberichten. 2. Aufl., Dt. Taschenbuch-Verl., München 1977. আইএসবিএন ৩-৪২৩-০১১০০-৯. ↑ Burger, Richard L. Chavin and the Origins of Andean Civilization. New York: Thames and Hudson, 1992. ↑ Beck, Roger B.; Black, Linda; Krieger, Larry S.; Naylor, Phillip C.; Ibo Shabaka, Dahia (1999). World History: Patterns of Interaction. Evanston, IL: McDougal Littell. আইএসবিএন ০-৩৯৫-৮৭২৭৪-X. ↑ ক খ Bawden, G. "The Art of Moche Politics", in Andean Archaeology. Ed. H. Silverman. Oxford: Blackwell Publishers, 2004. ↑ ক খ Kolata, Alan L. The Tiwanaku: Portrait of an Andean Civilization. Wiley-Blackwell, 1993. আইএসবিএন ৯৭৮-১-৫৫৭৮৬-১৮৩-২. ↑ Fagan, Brian M. The Seventy Great Mysteries of the Ancient World: Unlocking the Secrets of Past Civilizations, New York: Thames & Hudson, 2001. ↑ Pedro de Cieza de León (1553): The seventeen years travels of Peter de Cieza through the mighty kingdom of Peru, and the large provinces of Cartagena and Popayan in South America: from the city of Panama, on the isthmus, to the frontiers of Chile. Tr. & Ed. Markham. London: Hakluyt Society, MDCCIX. ↑ Giffhorn, Hans. Wurde Amerika in der Antike entdeckt? : Karthager, Kelten und das Rätsel der Chachapoya. 2nd ed. C.H. Beck, 2014. আইএসবিএন ৩৪০৬৬৬৪৮৯X, 9783406664892. ↑ Susan E. Bergh. 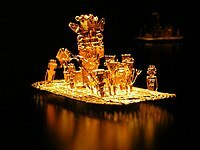 Wari: Lords of the Ancient Andes. Thames & Hudson, 2012. আইএসবিএন ৯৭৮-০-৫০০-৫১৬৫৬-০. ↑ Jar - The Walter Art Museum. ↑ Rowe, John H. (1948) "The kingdom of Chimor", Aus Acta Americana 6, (1-2): 27. ↑ Ember, Melvin; Peregrine, Peter Neal, eds. (2001). 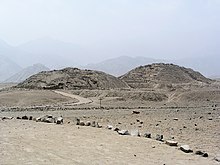 "Chimú". Encyclopedia of Prehistory. 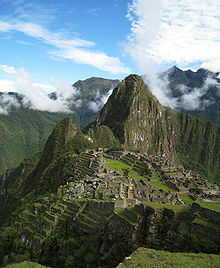 7 : South America (1 ed.). Springer. আইএসবিএন ৯৭৮-০৩০৬৪৬২৬১০. ↑ ক খ Historia de Colombia (tr.en. History of Colombia). Tomo 1 Zamora Editores, Bogotá, Colombia 2003. Dobyns, Henry F. and Paul L. Peru: A Cultural History. New York: Oxford University Press, 1976. ইনকা গার্সিলাসো দে লা ভেগা: পেরুর প্রাকৃত ইতিহাস. অনুবাদক অশেষ রায়. কোলকাতা: র‍্যাডিক্যাল, ২০১১। আইএসবিএন ৯৭৮-৮১-৮৫৪৫৯-৩৬-৩.